Established in 2009 following recommendations from the International Commission on Education for Sustainable Development Practice, the Global Masters in Development Practice (MDP) is a world-leading and uniquely innovative interdisciplinary graduate degree programme that blends health, natural, social, and management sciences--combined with cross-sectoral field training and professional local and international work-based placements to better understand international development problems and best practices. The Dublin MDP is a member of this global network of Master’s in Development Practice, headquartered at Columbia University, New York, linking with over 30 universities and hundreds of partner organisations worldwide. The two-year Masters in Development Practice encompasses an integrated theoretical and practical approach with multidisciplinary training in four “pillars”- health, natural, social, and management sciences. Eighteen core academic modules (link) provide rigorous training across the core pillars, complemented by masters level training in research design, methodology, and methods including training in leading edge quantitative, qualitative, and digital tools and techniques. The programme includes four work-based placements (link) which provide hands-on practical experience for students, both in International Development NGOs and International Intergovernmental Organisations. This programme aims to create a new generation of development practitioners with the skills to implement and manage comprehensive approaches to sustainable and efficient development. The Dublin MDP degree led by the Trinity College Dublin (TCD) School of Natural Science and delivered by staff from all faculties across the university, in collaboration with leading scientific researchers, and national and international organisations with specialist skills. 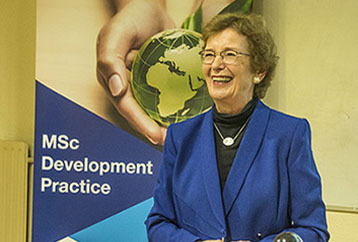 The goal of the Dublin MDP is to produce rounded development practitioners with a deep understanding of scientific methods and techniques to reduce global poverty, in addition to extensive on-the-ground training in developing country contexts, and in international organizations. The course modules are categorized according to each of the Global MDP Program’s four pillars—health, natural, social, and management sciences. Some are categorized as cross-disciplinary, although the program as a whole emphasizes the interconnectedness between development issues in these four fields. The MDP is rooted in evidence that effective public policy must be based science-based. Course offerings include a blend of traditional class-room based modules and three internships including two international field training placements. There are 4 field-based modules comprising international development fieldwork and work-based placements, locally and overseas. They constitute the core of the practical learning of the MDP programme, and will allow students to put into practice the knowledge acquired in coursework. In the first year, students will work with local Non-Governmental Development Organisations (NGDOs). During the placement, students will work on identified issues of research concern to the partner development organisations based in Ireland. With some guidance by the organizations, students will work in groups to produce the desired project outcome. Between June and August, MDP students will have the opportunity to do a clinical field training in partnership with Non-Governmental Organizations, government entities, and multi-lateral donor partners. This training programme includes opportunities to study, design, implement or evaluate diverse operational interventions that address critical development issues. The MDP is constantly expanding its lists of partners, to more universities, NGOs and governmental agencies around the world. In past years, the MDP Dublin has been able to send students to several countries of Africa and in South America, and is perpetually forging connections to create more choice for our students. Undertake a short field placement programme with a development organisation working at the global, international or national level. Allow students to work with development practitioners, programme/project officers and desk officers in a shadowing capacity to enable them to acquire direct organisational and programme management skills. Can I find my own internship for the fieldwork 1? Yes. If your project is prepared in a timely manner and fits the parameters defined in the course handbook and module outlines. Any student is free to look outside of the list proposed by the programme if their interests are not represented. Are students helped at all to find the second internship? Yes. Workshops are organized to help students improve their CVs and cover letters as well as to improve their visibility on social networks and the efficiency of their searches. Are students financially helped during the internships? Yes. The MDP provides a limited stipend to assist in the expenses of the field trip, such as the flight, the everyday life, and the research expenses. Padraig Carmody is an Associate Professor in Geography, from which he holds both a B.A. in Geography and History and M.Sc in Geography. He completed his Ph.D in Geography from the University of Minnesota in 1998. Subsequently he taught at the University of Vermont, Dublin City University, and St. Patrick’s College, Drumcondra. He also worked as a policy and research analyst for the Combat Poverty Agency in 2002-2003. His research centres on the political economy of globalization in Africa. His teaching interests are in development and economic geography. He has taught both undergraduate and graduate classes on Africa, third world development and globalization, in additional to human environment relations and regional development. Dr. Carmody coordinates the module Globalisation & African Development, and is Director for the MDP. Susan Murphy is the Assistant Professor in Development Practice with the School of Natural Sciences, Trinity College Dublin and Course Coordinator for the Masters in Development Practice (MDP). Susan's research interests are in international political theory, issues in global justice, human rights and climate change, gender and social inclusion. She was shortlisted for an ERC (European Research Council) Award in 2017 and has published in national and international peer-review and scientific journals on matters related to ethics and global development. In 2016 Susan published a monograph with Springer Studies in Global Justice - Responsibility in an Interconnected World. Susan lectures on Gender, Climate Justice, and Development Research and Practice. As part of her work, she has managed the design and delivery of 150+ international research projects in countries across Latin America, Africa and Asia, and over 100+ research projects with International Development NGOs in Ireland. Susan is a member of University Council and Trinity International Development Initiative (TIDI). She sits on a number of school committees including Research Ethics, Postgraduate Teaching and Learning, Athena SWAN School SAT and is a College Tutor for STEM Students. External roles include Board of Trustees - Oxfam Ireland; committee member of Future Earth Ireland; Board of Advisors, The Humanitarian Innovation Academy; and member of the UN SDSN. Susan has twenty years of management and professional experience, both within the University and also in Industry. Dr. McGlynn lectures on Climate Change: Science Development & Justice. Dr Ayat Abu-Agla is a Community Medicine consultant, with a MBBS, MPH and a Medical Doctorate. She has over a decade of diverse work experience in LMICs (mainly Sudan) through positions in healthcare, academia and professional associations. Her research are in the areas of Reproductive health, health systems and human resources for health (HRH) in post conflict and LMICS. Among the projects she led was the first mapping of health and medical educational pipeline survey in Sudan, the health labour market study with WHO-HQ/EMRO/AFRO and HRH migration. She is currently a Doctoral researcher based at the Centre for Global Health at Trinity College Dublin. She lectures on Reproductive and Maternal Health and HRH on the MSc in Global Health Programme. She also serves as TDR/WHO Implementation Research temporary adviser since 2013. Dr. Abu-Agla is the coordinator for Global Health. Matthew Saunders is an Assistant Professor in Plant Sciences within the School of Natural Sciences, Trinity College Dublin. He was awarded a Ph.D. in Plant Ecophysiology (2005) and a M.Sc. in Environmental Science (2001) from Trinity College Dublin and has worked as a post-doctoral research fellow in University College Dublin (2006-2012) and the James Hutton Institute, UK (2012-2015). His research interests include the response of plants to changes in their physical, chemical and biological environments and how this information can be used to assess the resilience and adaptive capacity of terrestrial ecosystems to global environmental change. This work utilises an integrated experimental and model-based approach to assess the physiological and environmental processes that regulate plant productivity, carbon sequestration, greenhouse gas dynamics, plant-water relations and energy budgets at the leaf, whole plant and ecosystem scale. Recent projects have focussed on the impacts of land use change, habitat restoration and extreme climatic events on carbon, water and nutrient dynamics in natural and agricultural ecosystems in both temperate and tropical climates. This work has directly contributed to the development of policy relevant, sustainable land management tools that are centred on the role of terrestrial ecosystems in the mitigation of, and adaptation to climate change. He has published in international peer-reviewed journals on matters relating to plant science and environmental change including Global Change Biology, Biogeosciences, Agricultural and Forest Meteorology and Ecology Letters. Dr Saunders lectures on Sustainable Agriculture & Land Use. Federico has done extensive empirical research in the Middle East and Southeast Asia where he has investigated the sustainability performance of supposedly experimental cities such as Masdar City in Abu Dhabi and Hong Kong. His work has been used by the United Nations and the United Kingdom’s Department for Environment, Food & Rural Affairs (DEFRA) to foresee future urban challenges and develop preventive policies. Building upon empirical grounds, Federico’s main theoretical aspiration (also the subject of his forthcoming book) is the development of urban equations for a sustainable urbanism. Other theoretical contributions include the concept of urban eco-modernisation, and the theory of de-composed urbanism and Frankenstein cities. Before joining Trinity College Dublin, Federico held positions at the University of Manchester, King’s College London and the London School of Economics and Political Science. Dr Conor Buggy is an Environmental Scientist and Engineer working as Assistant Professor in Occupational and Environmental Studies in the UCD School of Public Health, Physiotherapy and Sports Science. Conor is the Programme Director for the Masters in Occupational Safety and Health and Professional Certificate in Environmental Management programmes. His main research focus is currently on the impact education and training can have in organisational settings to change behaviour in particular cohorts. One study in collaboration with Dr. Seamus Kelly (UCD) focuses on the occupational health management of professional athletes and how occupational health awareness training can lead to better decision making for athletes’ long-term wellbeing. A further study in collaboration with Dr. Susan Murphy (TCD) is focused on the flexibility and impact of adult educational methods and frameworks for professionals working in the healthcare sector. Another research project is linked his teaching on the TCD Masters in Development Practice. 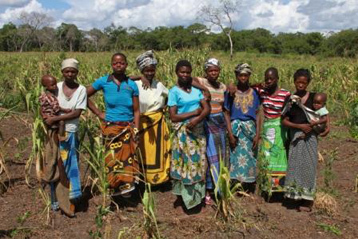 The project, in collaboration with Dr. Gayle McGlynn (TCD), involves a staged evaluation of climate change awareness in the education system of a developing nation, and is run in partnership with DUCE (Dar Es Salaam University College of Education) in Tanzania. The ultimate aim of this project is to prepare an educational package to ensure secondary school teachers of all disciplines can understand climate change and introduce to secondary school students effectively. Conor has been working with the UCD Centre for Safety and Health since 2010. Read Conor’s full research profile here. Cian O'Callaghan is an Assistant Professor in Urban Geography with the School of Natural Sciences, Trinity College Dublin. He joined the Geography Department in 2016. Prior to joining Trinity, he worked at Maynooth University between 2008 and 2016. At Maynooth he held the positions of Lecturer in Geography and Postdoctoral Research Fellow at the National Institute for Regional and Spatial Analysis (NIRSA). Cian holds a PhD from University College Cork (2009). Cian lectures within the area of Urban Geography, with a particular focus on global urbanisation, urban regeneration, urban cultural geography, and urban theory. His research projects have included: urban transformation and culture-led development in relation to Cork’s European Capital of Culture year in 2005; the political-economic and cultural role of Ireland’s ‘ghost estates’; and contestations over the reuse of vacant spaces in post-crisis cities. His research has been published in international journals including Urban Studies, Political Geography, Environment and Planning A, and International Journal of Urban and Regional Research. Patrick’s work spans political ecology, science and technology studies, and environmental humanities - fields that challenge traditional distinctions between the ‘natural’, ‘cultural’, ‘political’ and ‘technological’. Theoretical influences include Foucault, Marxian theory, Feminist STS and anthropology. Theory and politics of the commons. Martin Sokol is an economic geographer whose primary research interests revolve around social and spatial inequalities in the context of the ‘New Europe’. One of the key areas of his expertise concern the fundamental processes shaping economic geographies of contemporary Europe – the rise of the so-called ‘knowledge-based economy’ in the ‘West’ and the collapse of ‘state-socialism’ in the ‘East’ - and the implications of these two processes for cities and regions in Western and East-Central Europe. More recently, Martin has developed his research agenda to include the issues of finance and financialisation, and their implications for social and spatial inequality. Martin completed a PhD thesis at the Centre for Urban and Regional Development Studies (CURDS), University of Newcastle upon Tyne, England. His doctoral research engaged with the ‘knowledge economy’ and the ‘learning region’ concepts while focusing on ‘institutional thickness’ in the UK (Scotland) and East-Central Europe (Slovakia). Since then, he was involved in several major research projects, while holding research and teaching posts at University College Dublin (UCD), Queen Mary, University of London (QMUL) and University College London (UCL), among others. Martin joined Trinity College Dublin in 2013 and leads the Finance, Economy & Society (FES) Research Group. Dr Sokol is a founding member and Secretary of the Global Network on Financial Geography (FinGeo) and Fellow of the Regional Studies Association (FeRSA). He was recently awarded a prestigious European Research Council (ERC) Consolidator Grant for his project GEOFIN - Western Banks in Eastern Europe: New Geographies of Financialisation. Caitriona Dowd is a conflict researcher and humanitarian practitioner with a specialisation in conflict sensitivity and peacebuilding. She completed her PhD in Geography at the University of Sussex, UK, focused on the dynamics of violent conflict and identity mobilisation in sub-Saharan Africa. Her research has been published in several peer-reviewed international journals, including African Affairs, The Journal of Modern African Studies, Political Geography and Terrorism and Political Violence. Caitriona previously worked as Senior Researcher for the Armed Conflict Location & Event Dataset (ACLED) and Research Fellow in Conflict and Violence at the Institute of Development Studies (IDS). She is currently Humanitarian Policy Officer for Concern Worldwide, Dublin, where her role involves research and technical support on conflict sensitivity and peacebuilding programming in conflict-affected contexts. Declan Power is an independent security and defence analyst who has worked on projects in Africa with the European Commission involving counter-terrorism (CT) and countering of violent extremism (CVE). Previously he led the successful joint Irish-Swiss government project, Sustaining Humanitarian Presence Initiative, which provided conflict and crisis-management skills and advice to International NGO’s working under the UN in South Sudan. A former career soldier, Power served in the three combat arms of the Irish army on a variety of operations both at home and abroad. He was also a panellist/contributor on the 2015 White Paper on Defence. In addition to attending the military college, Power is a graduate of Dublin City University, Trinity College Dublin and has also completed the UNHCR’s Emergency Management program. He is one of the few people in Ireland to complete the UN’s Inter-Agency Emergency Simulation Instructor’s course. He has studied and instructed on various civil and military crisis management courses, including UNOCHA’s Civil Military Staff Planning Course, NATO’s CCOE School and the UK’s Brunel Centre for Intelligence and Security Studies (BCISS), the Irish Defence Force’s Command and Staff course and the UN Training School Ireland. Power also is the author of a number of articles, papers and books on security affairs, including From the Congo to Mali (Irish Studies in International Affairs 2013) which examined Ireland’s contribution to international peace support operations and Siege at Jadotville (Maverick House 2005), one of the few books dealing with the Irish experience of UN service during the Congo mission. The book was adapted for film in 2015. Applications must be made online. For further information on applying to taught courses in Trinity College, see Trinity Graduate Studies. Applications are now open for 2019/20 (September 2019 intake) at TCD Postgraduate webpage. Final Closing date is 30th June 2019. The Admissions Committee strongly recommend early applications, especially from international students, as we are reviewing applications on a regular basis. We aim to turn around all completed applications within 20 working days from date of submission (of all documents). Further information on eligibility and application to the Masters in Development Practice is available from the Graduate Studies Office. Applications are now open for 2019/20 (September 2019 intake). Further details on the admissions process can be found at here. Students enrolled on this postgraduate programme will be eligible to apply for accommodation at both Trinity College Dublin. The TCD Masters in Development Practice is part of the Global Master’s in Development Practice Network. The secretariat for this network is based at the University of Colombia in New York. For further information and details of the other MDP programmes in the network please see www.mdpglobal.org and University of Colombia in New York. The Trinity Masters in Development Practice offers one fully funded scholarship to a student from a developing country. This scholarship will cover tuition fees and a yearly stipend for both years of the programme. To apply, please include a 500 word statement in the section provided on the online course application form. The fields of international development and humanitarian response are very competitive, but the Dublin MDP provides a great combination of skills, education and experience to succeed. Currently I am working with International Medical Corps responding to the ongoing Syrian crisis, and I am often able to draw upon my studies in Dublin on global health, statistics, project management, development in post-conflict scenarios and many others. The cross-disciplinary nature of the MDP is particularly valuable as it allows me to coordinate on projects related to topics such as gender-based violence, human rights or monitoring and evaluation. While it required a lot of hard work and dedication, I am very thankful that I chose to go to Dublin for my masters in development practice. I started the MDP course in Dublin after volunteering in East Africa over the course of two summers, and wanting to learn more about ‘how the world works’. What really attracted me to this particular course was the opportunity to partner the academic learning with field/work placements. My research placement was in Kigali, Rwanda, where I researched legislation on gender-based violence. For my second year internship I secured a place with UN Women in New York, working with the Donor Relations & Reporting Team. I’ve found that having this element of practical experience to complement the academic experience has definitely helped me moving forward into the work place. Before I started the MDP, I wasn’t sure how I could apply my undergraduate degree in engineering to the course. I soon learned that the course draws on the widely varied knowledge, skills and experiences, both of the students and module coordinators. From research and statistics to project management; from economics to conflict, and so on. In this way, we could not only employ our different strengths, but also learn from others in areas that we might feel weaker. I enjoyed the two years of the course, and would recommend anyone seeking a course in development to consider undertaking the MDP. The combination of the theory and practice has made me feel and live the uniqueness of the Masters in Development Practice, an interdisciplinary program. Interactive sessions with development practitioners, worldwide high profile pundits of Sustainable Development from different angles through live seminars, lectures and simulation-fashioned exercises have altogether enriched my understanding of the world, particularly development problems & prospects and international development cooperation, in addition to enlightening and enhancing my critical thinking, problem solving skills and even expanding the network for my career, just to name a few. Furthermore, the hands-on experience on development bottlenecks, through field placement (in a development organization), has shed more light on the multi-faceted and complex nature of development issues. From that, I grasped more about the relevance and usefulness of the interdisciplinary approach of this program. Moreover, the professionalism coupled with a devoted service of the TCD MDP coordination team has been highly contributing in creating an enabling environment for my learning. To sum up, I honestly don`t think I would have got that experience and great opportunity from any other program, if not the Masters in Development Practice I have been pursuing at TCD. Being an MDP student has been a tremendous learning experience for me. This program has offered me a multidisciplinary approach to international development and has exposed me to great minds from all over the world. I have particularly enjoyed learning from my fellow students about their unique educational backgrounds and global development experiences. The international selection of students and faculty in this program prepares students for employment in the multicultural world of development practitioners. The Dublin MDP particularly cultivates an atmosphere of invaluable insights and internationalism that are not offered by many similar programs. While working in a developing country, I realized all the gaps I had in my knowledge base and the skills that I felt I needed to be a more effective development practitioner. The MDP appealed to me because I felt it taught in the most effective way, through doing, through practical experience. I have not been disappointed. The skills acquired in research and analysis will be directly marketable as I transition into my career in development practice. The wide range of topics covered academically, some of which I was more familiar with, others about which I had no prior knowledge, provide a substantial base from which to work. Further, the classmates with whom I’ve worked over the past 2 years have been one of the most valuable and enriching elements of my time. Sharing our experiences and going through the field placements together has given me more diverse perspectives, perspectives which I feel are absolutely essential in this field. An opportunity to pursue MSc. Development Practice at Trinity College Dublin has exposed and provided me an opportunity to interact and learn from the finest researchers and practitioners at the apex of the development sector globally. My cross-disciplinary curriculum in natural sciences, economics & social sciences, management & health sciences has helped me build on my critical reasoning skills in the four major pillars crucial to development studies and evidence based policy making. The internship modules as a part of the course with various International development organisations has given me an immense breadth of cross-continent exposure in multi-tasked project management skills, policy analysis, communication, programme evaluation, drafting. The modules apart from honing my research skills has also empower me to deal with convoluted issues through medium of workable pragmatic solutions. It has equipped me with a practical understanding of disparate perspectives by working in different verticals of tasks. It would help me explore multitude approaches in solving a challenge, including data driven and hypothesis driven problem solving. The best part is the class environment. My classmates from diverse backgrounds and various countries have certainly helped me build my interpersonal skills. I would recommend this course to anybody who is looking for a more pragmatic approach towards engaging with the development sector. My time with the MDP program thus far has been both enlightening and inspiring. The program is a great combination of sciences, human rights, policy studies, and more. Our faculty are experienced in the field and quite worldly. I have also found myself surrounded with some of the most generous and caring classmates I've ever had. Everyone in this program, in Dublin, and in Ireland as a whole, have been unbelievably helpful, and I look forward to the challenges and excitement in the coming semesters. Having just finished my first semester, I can definitively say that choosing the Dublin MDP program was the best decision of my life. From the first day, you are thrown into a fast-paced and dynamic learning environment with classmates who have diverse backgrounds and bring a wide variety of life experience to the table. The classes you take are very engaging and there is never a shortage of passionate debate with professors and classmates. The small class size also allows you to interact closely with your lecturers and classmates. I have found that it is easy to make friends very quickly in this environment. Despite the demanding academic environment, there is much more to this program than coursework. This program has a vibrant social life with frequent wine receptions, meet ups at the student pub, and nights out in town. Dublin has a great nightlife and there is a plenty to do and see in Ireland. In addition, there are plenty of opportunities to network and to engage in development projects with the local Irish NGO sector and abroad in the Global South. There are also plenty of travel opportunities as mainland Europe is very accessible and we engage in research projects in central Africa over the summer. Going to school in Dublin has been nothing short of spectacular. In addition to the prestigious reputation, this program offers a great learning environment. I have taken full advantage of the opportunities that have been offered to me and am very happy with my experience. It took me five years to find a Masters course that was perfect to what I had in mind for my career development. After my first semester in the MDP programme, it was definitely worth the wait! The classroom experience has been one of a kind, from the lecture delivery to the weekly challenges that provide a platform for skill building and knowledge sharing. The lecturers are experienced and have worked in different parts of the world, so it’s always interesting when they share their knowledge (and stories) with us! It is an exciting time for us now as we are also preparing for our fieldwork experience in different developing countries. Overall this course is well coordinated and I am appreciative of how it has the perfect balance between theoretical and practical learning content. I highly recommend it for those who have a passion in pursuing a career in international development! Through excellent internship experiences and a challenging class structure, the MDP experience in Dublin set me up to competently enter a career in the field of international development. As an environmental consultant focusing on the environmental and social impacts of various industries in South East Asia, I find myself incorporating what I learned in the MDP to my professional career on a daily basis. The multifaceted and holistic nature of the course allows for students to gain an understanding of many topics that that all fall under the development umbrella. I would highly recommend the MDP course in Dublin to anyone who wants to enter a career in international development. What is the Dublin MDP? 1. What is a Master’s in Development Practice degree? The Masters in Development Practice (MDP) is a two-year graduate degree providing graduate-level students with the skills and knowledge required to better identify and address the global challenges of sustainable development, such as poverty, population, health, conservation, climate change, and human rights. 2. What makes Dublin MDP different? Currently the bulk of development leaders are trained in narrow fields, usually in the social sciences, such as economics. By broadening their training and providing them with a knowledge base including health sciences, natural sciences, social sciences, and management, and by taking an integrated, holistic approach to finding solutions to development challenges, they will be able to more effectively understand and address the root causes of extreme poverty and the challenges of sustainable development. Further the Dublin MDP provides students with a unique practical-learning experience through the four professional work-based placements that students undertake over the two years of the programme. From your time of arrival, you can expect to be engaged in practical projects and engagements with both national and international development organisations and key actors. Who are Dublin MDP students? 3. What type of student pursues this degree? As a multidisciplinary programme, a wide range of background profiles (engineering, international relations, computer sciences, natural sciences, law and political sciences) are part of the programme. Recent graduates, as well as early and mid-career development professionals are pursuing the degree, including national and international students. B) What are the special characteristics (requirements) of successful Dublin MDP candidates? The minimum graduate admission requirements are: (1) a bachelor’s degree or recognized equivalent from an accredited institution; (2) a satisfactory scholastic average, usually a minimum grade-point average (GPA) of 3.5 (B) on a 4.0 scale; and (3) readiness to take on graduate training in your chosen field. International applicants must demonstrate English proficiency. 4. I am an undergraduate student with little practical/work experience, is this Dublin MDP for me? Yes. We strive to attain a diverse environment in the MDP program to enhance peer-learning opportunities. We welcome people from a wide variety of backgrounds and find that undergraduates with little work experience have knowledge that contributes to the MDP experience. Approximately one third of the students in any given year are straight out of undergrad and are properly prepared to engage in this program. 5. Are applicants required to have worked professionally for a minimum period of time? No. However, strong knowledge of International Development, volunteer experience, and any other relevant information will strengthen your application. 6. I am a professional with many years of working experience looking to further education, is the Dublin MDP for me? Yes. The MDP program strives to bring together academia and practical professional experience. The knowledge and skills obtained in the workplace can easily be applied to the issue of sustainable development. We welcome those who can share their experiences and knowledge with their classmates and strongly believe that this enriches the learning environment. 7. Is there a specific academic background required to the programme? No. All of our students come from a wide-range of academic backgrounds. Some of backgrounds include economics, international relations, environmental science, engineering, physics, earth science, management, commerce, geography, philosophy, languages, film, biology, and sociology. 8. How many students are accepted each year? We accept between 20 and 30 new students every year. 9. I am an international student. Will that affect my chances of being admitted? No. International students are strongly encouraged to apply. Approximately half of our students every year come from outside of the European Union area. Our current student body includes people from every continent on the planet. MDP candidates are chosen based on their background, qualifications, and match with the program. Where can I go with a Dublin MDP? 10.What professional opportunities will I have with this degree? The Dublin MDP enables students to pursue their interests in a wide number of disciplines. With the broad-range of topics addressed, practical experience obtained, and research and analytical skills acquired, graduates are prepared for the challenges presented by sustainable development and its related fields. Graduates have gone on to work in Non-Governmental Organisations, International Intergovernmental Organisations, Government agencies, and the Private Sector. 11. What skills will I acquire? Within the course modules of the Dublin MDP, students will acquire skills related to research methods, statistical analysis via STATA and SPSS, economic models and impact evaluation, policy frameworks and analysis, project creation and management, in addition to the exposure to current research and work in sustainable development. 12. A. Where will fieldwork placements be? The two field placements are throughout the world with various organizational and academic partners of the Dublin MDP. Past placements have included: the National University of Rwanda, the Rwanda Development Board, Repoa-Tanzania, Universidade Federal Rural do Rio de Janeiro (Brazil), Trocaire (Rwanda), UNESCO (Senegal), OECD, UN Women (Regional Office- India), WHO, FAO, BRAC (Bangladesh), UN OCHA, and UN Headquarters (New York, USA). B. Can I choose the location of my summer field placements? For the 1st field placement, a list of available opportunities will be made available from which students and faculty will decide the placement best suited for the student’s interests. For the 2nd field placement, students will be primarily responsible for finding their own placements in line with their pursuits and career goals. 13. What non-academic opportunities will also be available? In addition to the modules and fieldwork placements, students are encouraged to engage in the College Community through regular seminars and conferences run by Trinity International Development Initiative (TIDI), The Sustainable Development Solutions Lab, and other collaborating bodies. Students will have full exposure to current research by students, faculty and visiting scholars, in addition to seminars given by development professionals. Further, students will have ongoing opportunities with our practice-based organizational partners as need arises. For example students will have opportunities to take on extracurricular activities with Dochas, the Irish association of Non-Governmental Development organisations. The programme coordinators engage in a wide range of outreach activities, including hosting cultural events and exhibitions, guest practitioner experts, all aimed at linking students into the vibrant international development community in Dublin. 14. Is there a dissertation/thesis requirement? Yes, there is an independent research project, providing novel insight into a selected research area and written up as a dissertation. Please, check the funding opportunities section. 16. Can I defer my offer of admission? With permission of the Programme Coordinator (Dr Susan Murphy), places can be deferred for up to one year upon payment of an initial deposit of €500.